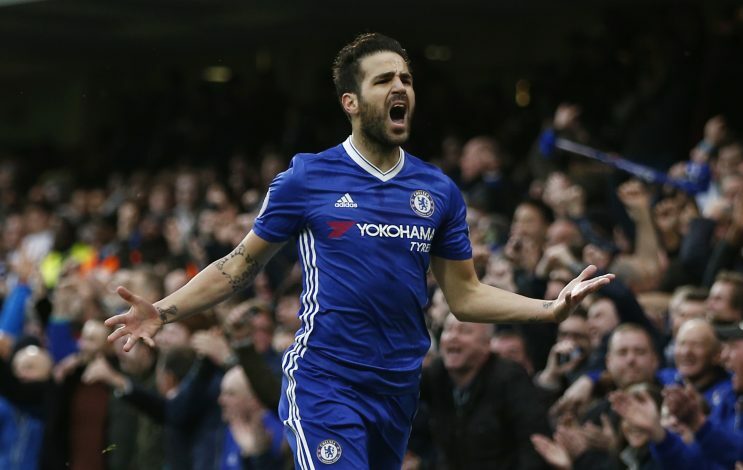 European Giants AC Milan and Manchester United have reportedly emerged as interested parties for Chelsea midfielder Cesc Fabregas. The Spaniard recently made his 300th Premier League appearance in Chelsea’s 3-1 win over Swansea, wherein he managed to bag a goal and an assist. But despite Saturday’s impressive performance, the 29-year-old has seriously struggled for game time under Antonio Conte this season, with his match against the Swans being just his sixth league start this season. Amid Fabregas’ continued struggle to book a concrete spot in Chelsea’s starting lineup, Serie A outfit AC Milan are reportedly looking to offer him a way out this coming summer. The Rossoneri are prepared to offer Chelsea £27 million for the midfielder’s services, and the large sum is bound to test Conte’s resolve. Meanwhile, Manchester United have also emerged as new surprise candidates in the race for Cesc Fabregas’ signature. Jose Mourinho, the man who brought the former Barcelona star to Chelsea in 2014, is now interested in re-signing the Spanish international, as per recent reports from The Telegraph. However, Fabregas remains adamant that the only way he will leave the Blues, irrespective of the game time he receives in the meantime, is if the club directly asks him to secure a move away from Stamford Bridge. The midfield maestro recently stated (via Goal): “In the beginning, when I didn’t play, I told people to not even speak to me because I was really upset. “But now that changes with time, age, maturity and experience, which all help you to understand that the most important thing is always the team. Don’t get me wrong: I want to play. But sometimes you have to fight for it.